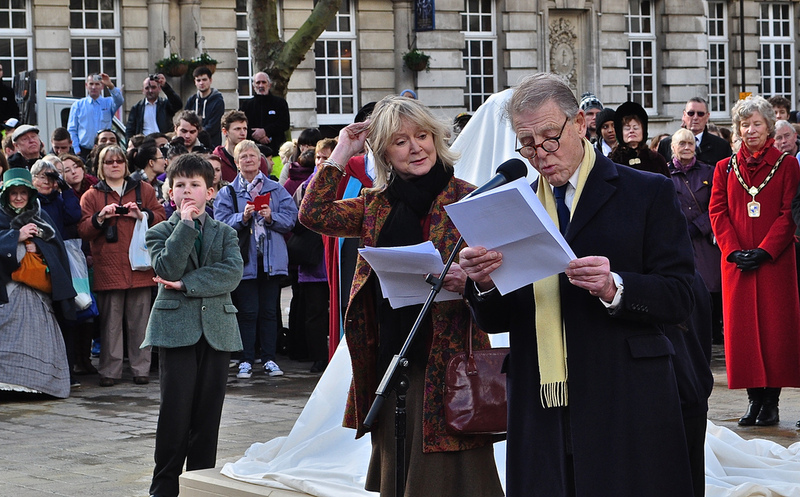 It was a truly British occasion – 7th February 2014. 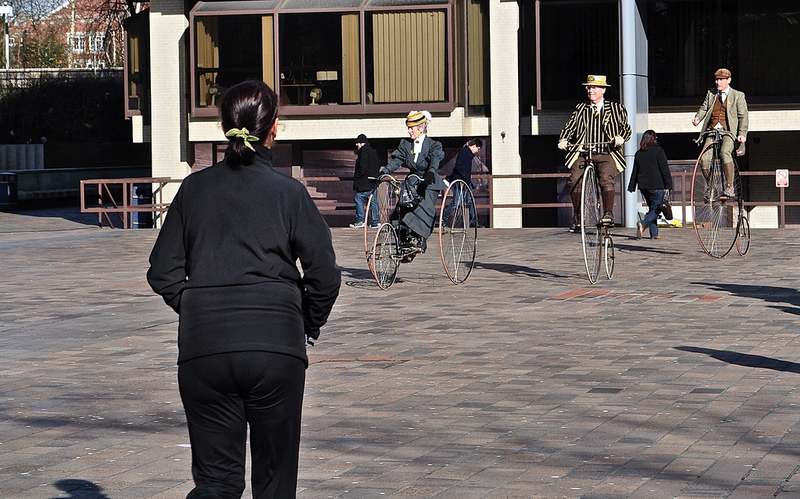 A few ladies and gentlemen were dressed in Victorian attire and suddenly, through the Guildhall precinct on what can still be termed Commercial Road, came a team of penny farthing cyclists weaving through the pedestrians (The Pickwick Bicycle Club) – all to a backdrop of a brass quartet. Unusually, given the recent weather, the sun was shining brightly. Commercial Road of course is what was once called Mile End Road and that was where Charles Dickens was born and where his birthplace museum still stands. 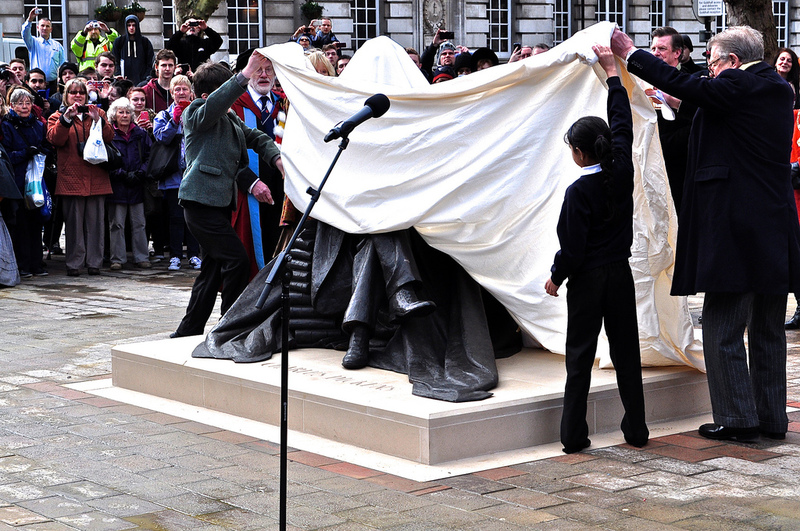 It might give you a bit of a hint as to whose statue is is, cordoned off, hidden under a shapeless white tarpaulin, protected by three slightly sheepish security guards. There was a chap selling hot chestnuts – quite an appropriate Victorian touch we thought – and a hundred or so onlookers, mingling with the 50 or so descendants of the Dickens family – waiting for the off. 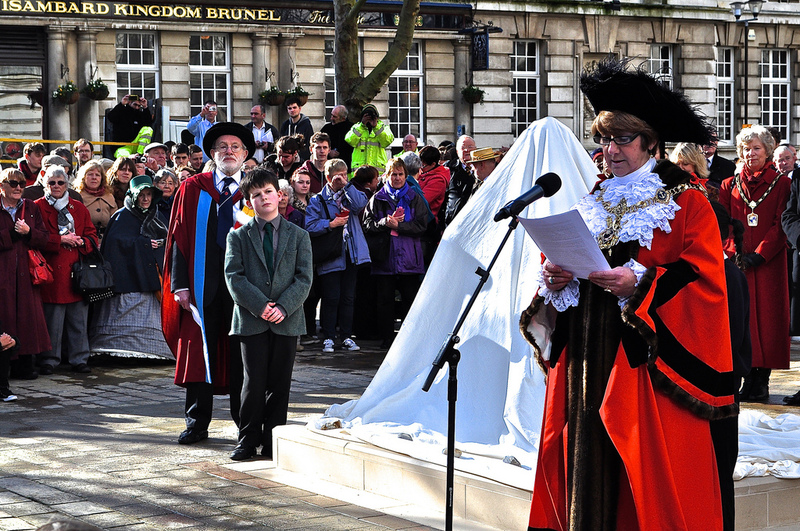 Firstly, we had the historian relating the story of the statue, then the Lord Mayor, followed by readings by thespians and supporters of the statue, Edward Fox and his wife Joanna David, before the deed was done and the statue was revealed by said actors, a young girl from the Charles Dickens school in the city and his great, great, great, grandson, Oliver Dickens. I share a birthday with the great man so of course, I was there for his 202nd birthday celebration and the big reveal. When I could get near the statue through the scrum of the media, I find I do indeed like it – it’s unusual in that the subject is seated, not standing. Surrounded by books with a book in hand, Charles looks like he was just about to spring into action to address his audience. Sculptor Martin Jennings, I discover, also created the statue of Sir John Betjeman in St Pancras so without knowing it, I was already a bit of a fan before I finally saw his latest work. 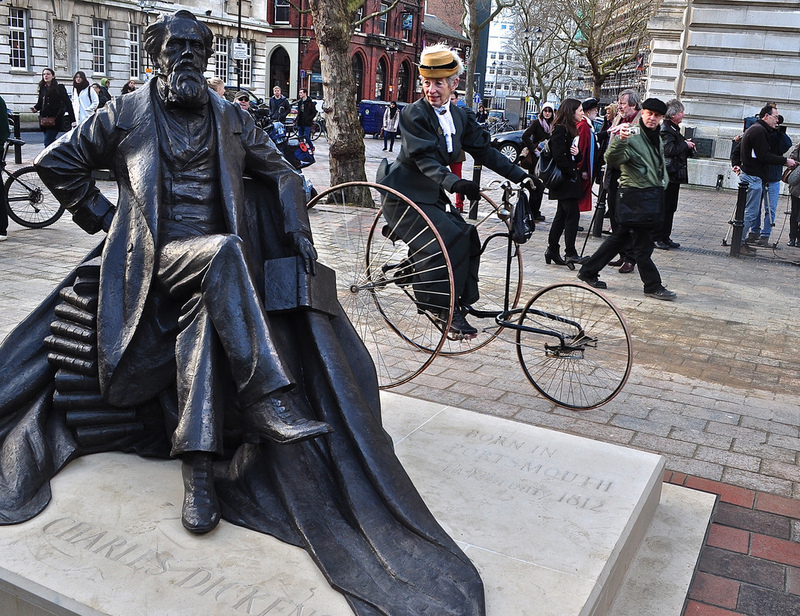 Make it part of your Dicken’s Trail and take a dreaded selfie with it (like the younger descendants of Dickens did), and even sit on it – apparently, it is a statue for touching. 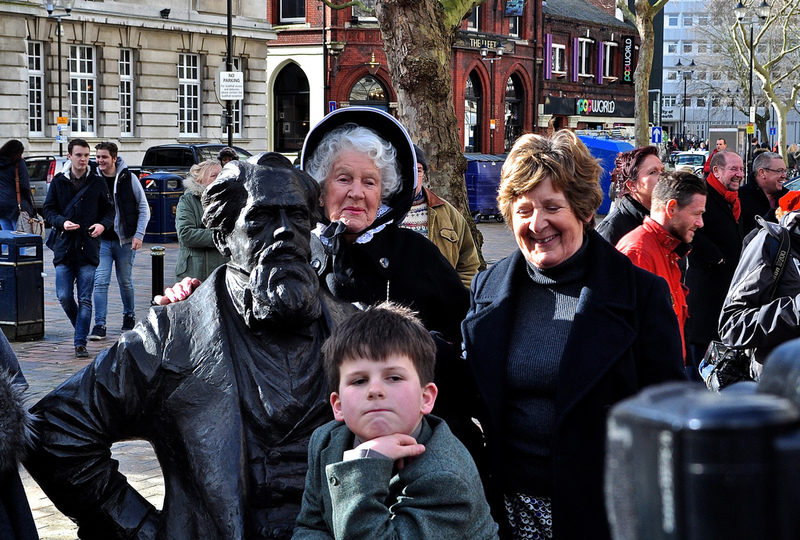 It was a great occasion, well done by Portsmouth Council, and about time the great man was honoured in his home country for this is the UK’s only statue of Charles Dickens. To mark the occasion, visit the Charles Dickens Birthplace Museum in Old Commercial Road, Portsmouth. It’s opening for a preview to its April formal opening to mark the occasion 16th – 19th February, 10am – 5pm. 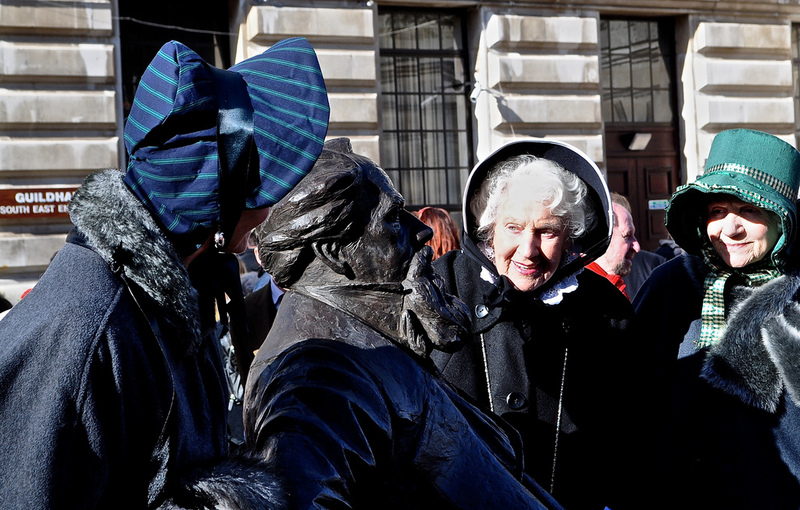 When there, grab a Dickens Trail leaflet – there’s certainly more to find in the city than you might think.